If your chain breaks on the trail, it can normally be fixed very easily with a chain tool. The tool is designed to push out the rivet pins that hold the chain together. Good chain tools are designed to stop pushing just before the rivet leaves the chain completely, so it’s easy to push the rivet back through when you re-join the chain. You might have a multi-tool that has a built-in chain tool, or a single-purpose chain tool to carry with you on the trail. There are also full-size tools for use in a workshop. All of them work the same way. Find the break in the chain (pretty obvious) or the twisted or stiff link. You’ll find the stiff link by shifting to the smallest front and rear cogs, then running the chain backwards. Watch the lower pulley on the rear derailleur – when the pulley “skips,” you’ve found your bad link. Before you even use the chain tool, if you have a stiff link in the chain, just grab the edges of the chain either side of the stiff link, place your thumbs on the plates of the stiff link, and bend the chain from side to side. That should be sufficient to loosen the tight rivet. 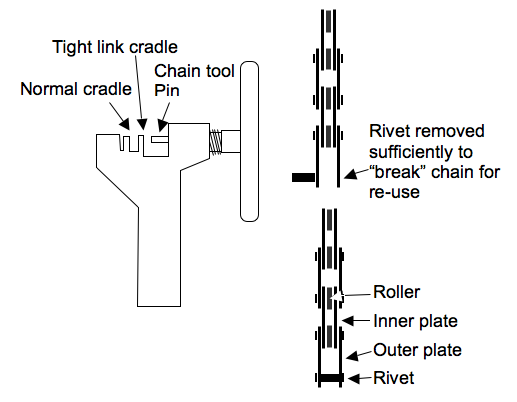 To remove a twisted or broken link, and rejoin the chain, place the chain on the normal cradle of the chain tool with the rivet closest to the bad link lined up with the chain tool pin. Use the chain tool to push this rivet through so that it is almost popping out of the opposite plate. Don’t push it all the way out because it’ll be really hard to put back in. Now, you should be able to remove the bad link by removing the chain from the tool and twisting it to separate the chain at this location. Do the same on the other side of the bad link, being careful to end up with an inside and an outside piece of chain to join together. Now, pop the inside piece that you are left with into the outside piece making sure that the roller is in place and that the rivet lines up with the hole. Use the chain tool to push the rivet back through. As soon as the rivet has emerged through the outside plate as much as the neighboring rivets, stop and move the chain onto the tight link cradle part of the tool to finish tightening the rivet through. This way, the outside plate is free to move, so the link doesn’t end up tight. You can get a good quality Park brand chain tool from Amazon for around $15. Don’t go with the dirt cheap ones – I’ve found that they tend to break after just a couple of uses. Something that makes fixing the chain easier is “missing links” or “power links.” These replace one of the outer plates in the chain with a special plate that clips in rather than needing to be riveted in place. I like the KMC brand missing links better than all the others, especially because they’re re-usable. Here are 11-speed, 10-speed, 9-speed and 7 or 8-speed links on Amazon (in packs of 6). Carry one with you whenever you ride, along with the chain tool. A PowerLink consists of two outer chain plates with one rivet each, and special slots for the opposing rivet to slide in to. Once joined, chain tension keeps the link together but it can be removed by hand when necessary. If you have the time to think about it, use the chain tool with the handle facing away from you so that you push the rivet out towards you when you are splitting the chain. This makes it simpler to work on when you are re-joining the two ends. Bring the two pieces to be joined to the bottom of the loop (between the rear derailleur and the bottom of the chain rings). Now the rear derailleur allows you to take up slack as needed. Check you threaded the chain through everything it needs to be threaded through (front and rear derailleurs, rear frame triangle) before joining it again. Compare against a friend’s bike if you are unsure. If you are using a SRAM PowerLink, KMC Missing Link or similar, leave two inside links free when you break the chain. The PowerLink replaces an outer link. To remove a PowerLink easily, squeeze the middle of the plates together (thumb and finger on the flats of the plates) as you slide the two halves to their open position. Some chains (notably Shimano HG) require a special rivet to replace the one you remove with the chain tool. You can use the existing one, but it won’t be very strong, so it’s only good as a temporary repair. Carry a Missing Link with you to use in these situations.